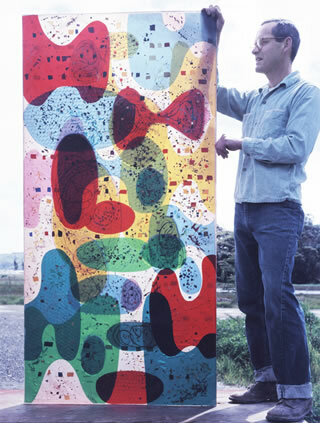 Rice stands alongside a tall, colorful entryway glass screen he created for Melton and MJ Ferris, 1957. 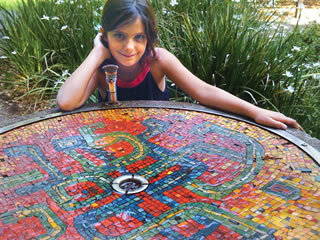 Rice's great granddaughter Amira Porter Stauffer poses alongside a mosaic drinking fountain Rice produced for UC Berkeley, 1955. Still, life was never easy. Rice, his wife Miriam, and daughters Mira, Rachel, and Felicia shared a houseboat that Rice hauled onto the shore of Corte Madera Creek, just off increasingly busy Highway 101 in Marin County, before the road became a super-highway. Rice worked in a small studio he’d built near the house, often bringing in friends and fellow artists as assistants. Besides making art, Rice taught art—to prisoners in San Quentin from 1951 to 1953, then at the College of Marin from 1953 to 1970. In the mid 1960s Rice turned his back on public art and on gallery shows—save for a community gallery now and then—and became an avant-garde filmmaker. Rice moved, moreover, from the Bay Area, with its active art scene, to the hamlet of Mendocino, years before it won fame as a historic town and tourist mecca. To a large degree he dropped out of sight—which is where he remains today. His work was not included in the recent Pacific Standard Time exhibits of mid-century art and design. His art cannot be found in major museums. Much of it remains in private hands—often that of his family. His films are in the collection of the University of California, Santa Cruz, but are not commercially available. Perhaps Rice came to conclude that working in architectural settings no longer allowed him to make “a personal statement.” Or perhaps it was making a statement that ran counter to his feelings.